Do you have any patterns or do you make any plus sized front wrap albs? 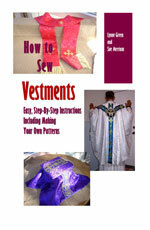 I am in need for an inexpensive alb for the diaconate program I'm currently in. I am sorry, but the only alb pattern we have for sale can be found here. We do no offer a pattern for a front-wrap alb.